There are plenty of reasons to find a great pair of winter gloves, especially if you are taking part in winter sports. Your hands are often one of the most sensitive body parts when it comes to feeling the cold, and leaving them exposed to extreme temperatures can not only be uncomfortable but also dangerous. Whether you are looking for waterproof gloves for ski and snowboarding or fleece gloves for gentler winter exploring, you should make sure they are up to the job and able to keep you warm enough to get on with whatever you are up to. There are various types of winter sports gloves available on the market, each with different specialist features making them perfect for different situations. If you’re not sure where to start when it comes to choosing the right womens winter gloves, consider all of the options available and see how they fit with your individual needs. Softshell gloves are lightweight and allow for easy freedom of movement, which is great if you want to keep your hands active. Despite their light nature, they are designed to be waterproof and windproof, to keep your hands warm in difficult conditions. These weatherproof properties are particularly useful for all kinds of winter sports. Another type of women’s glove is fleece gloves. These are generally constructed from a tightly-knit fabric, keeping them close to the skin and retaining warmth. Although comfortable and stylish, fleeced gloves aren’t designed to be waterproof, and so are not usually the best choice for those who need all-round protection. For those who like the comfort of fleeced gloves, but that need a more enhanced level of protection, liner gloves can be worn underneath a pair of soft shell or insulated gloves to give two layers of hand protection and an alternative option for when your situation changes. Much like softshell gloves, insulated gloves are crafted to keep your hands protected from whatever the elements might throw at them. 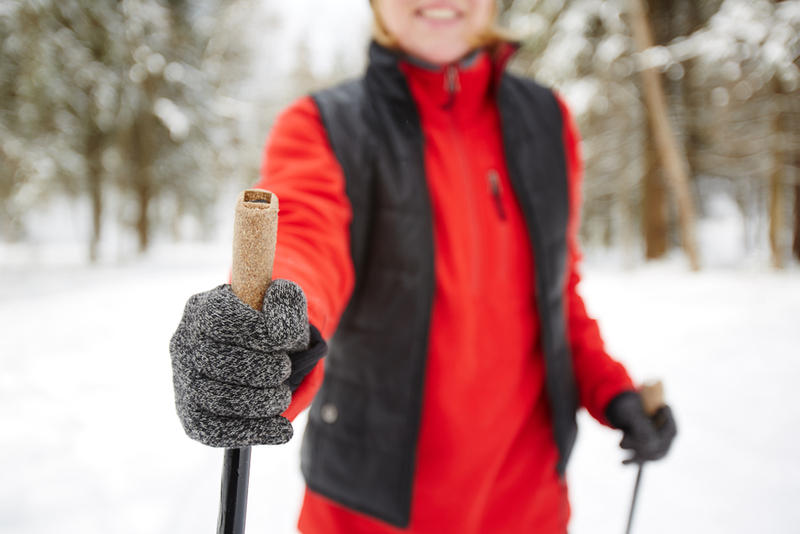 Womens insulated gloves can be made with a variety of fabric blends and ultimately are great for keeping your hands warm and dry, which can be essential with many winter sports. As well as checking out the best possible winter gloves for your needs, you will also need to take note of any specialist features that enable them to make life even easier for you. Firstly, the material they are made from will be very important to note. Whilst leather gloves give a great level of protection, gloves that use gore-tex technology will also benefit from a high level of breathability – meaning that your hands won’t overheat as your body works hard. Synthetic and polyurethane gloves can provide a level of protection in between leather and gore-tex, which might be an ideal option for your chosen sport. For sports where you need to be able to hold on tight, gore grip technology can help you to stay in control protecting your palms as you go. In a similar way, gloves with articulated fingers use additional fabric to reinforce the fingers of the gloves, making sure they are tough, weatherproof and ready for action. Many ski gloves will use wrist and cuff closure systems to really make sure they keep out any snow or damp. Whether they are under the cuff or over the cuff, many feature a tight cuff fastening feature to help keep your gloves in place and as tight to your hand as possible. Zipped pockets and nose wipe features can also feature on your gloves, making it easy to keep them on at all times and to make the most of their functionality. Feel like you know your fleeced gloves from your gore-tex ones? Browse designs from all of the top winter sports specialists all in one place at Flybery.